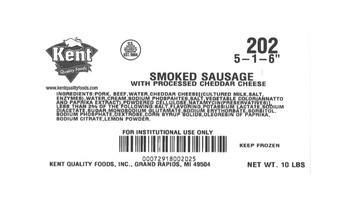 Kent Quality Foods of Grand Rapids, Mich., is recalling approximately 308,430 pounds of ready-to-eat hot dog and sausage products. The products contain soy, an allergen not declared on the label. The label for the spice mixture used in the production of one of the Beef Polish sausage contained hydrolyzed soy protein as an ingredient. However, the Beef Polish Sausage does not list the soy ingredient on the finish product label. Although the Beef Polish sausage product is the only product that is formulated with the spice mix containing the soy ingredient, there are several other ready-to-eat sausage and hot dog products that are implicated in this recall action due to potential cross contamination via shared equipment during the raw and ready-to-eat processing steps. The complete list of recalled items, produced from September 9, 2017, through April 29, 2018 can be found here. The recalled products, bearing establishment number “EST. 5694” inside the USDA mark of inspection, were shipped to distribution and restaurant locations nationwide. Consumers with questions about the recall may contact Stephen Soet at (616) 459-4595.